Hello ... Hello ... my old friends ... It's great to see you once again! One of the artistes in the ELO [and related] universe who has long been overdue a mention here on ELO Beatles Forever [ELOBF] by Yours Truly KJS is Steve Gibbons [and, of course, his fantastic band]. Steve is perhaps best known for his 1977 Top 20 hit "Tulane" [a #12 hit in the UK Singles chart] but his musical history goes back much further. A glance at the poster [opposite, left] reminds the reader of Steve's work with the likes of Ronnie Wood, Bill Wyman, The Uglys, The Idle Race and The Dylan Project. But Steve has also shared the stage also with ELO, Lynyrd Skynyrd, The J Geils Band, George Harrison and Nils Lofgren [amongst many others] down the years too. His musical journey is very much intertwined with the likes of Richard Tandy, Dave Scott-Morgan, Roy Wood, Trevor Burton, Bev Bevan and Denny Laine [also amongst not a few other 'Brum Beat' legends]. 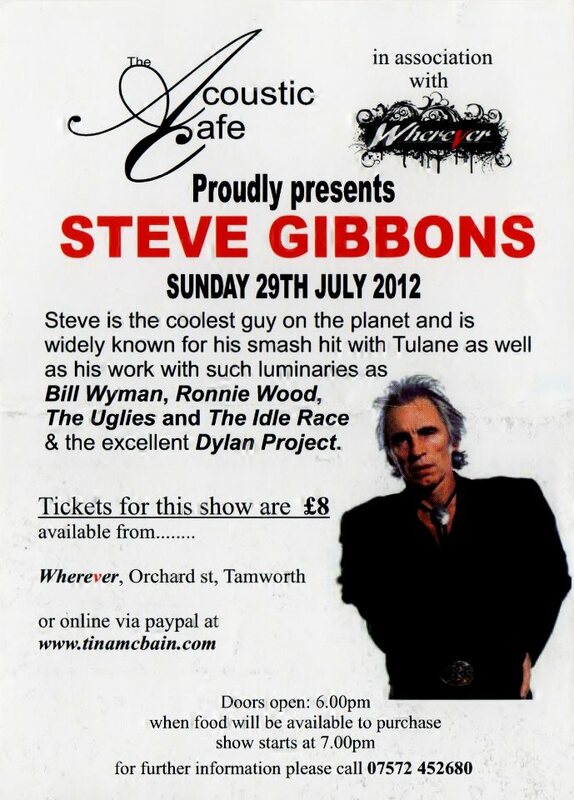 The Steve Gibbons Band continues to tour extensively to packed houses - both nationally and internationally. ELO Beatles Forever [ELOBF] recommend Steve Gibbons to those enlightened folks who enjoy the music of ELO, Jeff Lynne, Roy Wood, The Move, The Idle Race, 'Brum Beat', The Beatles and related artistes.